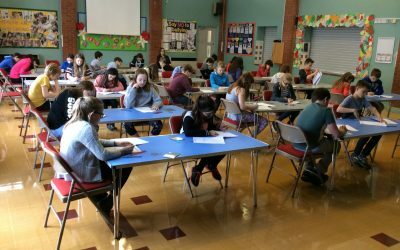 This week, the Year 6’s having been doing practice tests in the hall in preparation for their actual SATs in May. 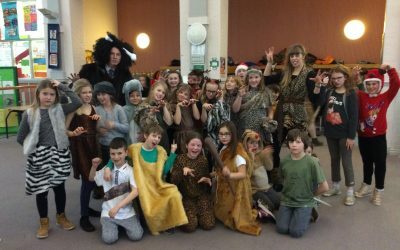 They have all worked really hard this week and both Miss Platts and I are very pleased and proud of all their efforts. Well done guys! 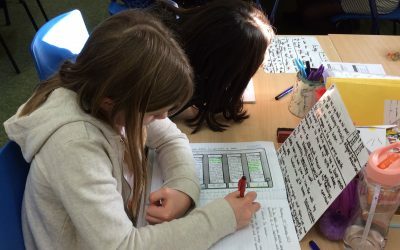 On Tuesday morning, Class 8 applied their understanding of Roman Numerals to plot key dates from history onto a timeline, writing in the dates in Roman Numerals rather than our own number system! 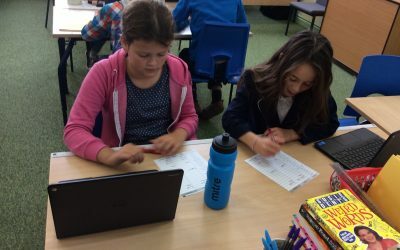 On Monday morning, Class 8 learnt about what is meant by ratio and proportion, two concepts many children were under confident with before the session. 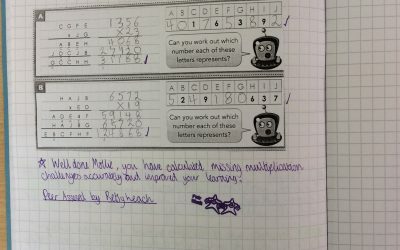 The children then used their much-improved ratio skills to solve a range of problems successfully. Exploring The World By Numbers And Measurements! 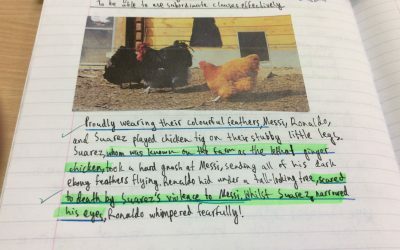 On Tuesday morning, Class 8 looked at the key features of a biography in our English lesson. 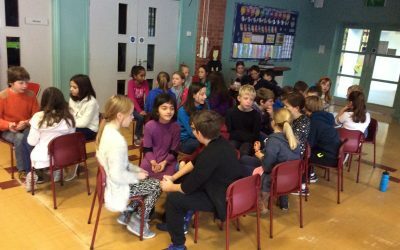 The children went in pairs and took it in turns to ask a series of interesting open and closed questions about each other’s lives so far! 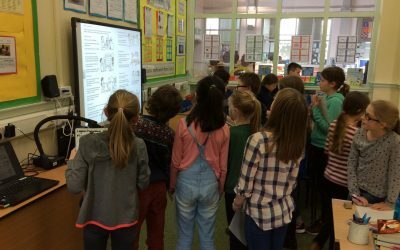 On Tuesday morning, Class 8 watched a video clip about a family friendly robot called Jibo. 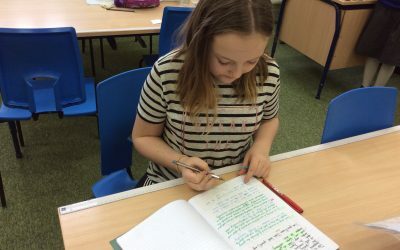 Each child then wrote a diary entry from a child’s perspective explaining what life was like living with Jibo, thinking carefully about the benefits as well as potential drawbacks. 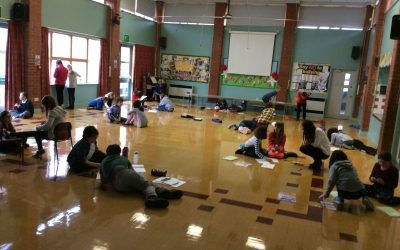 Class 8 were lucky enough to have a special art morning taught by Louise Brooke, an art specialist from EBOR Academy. 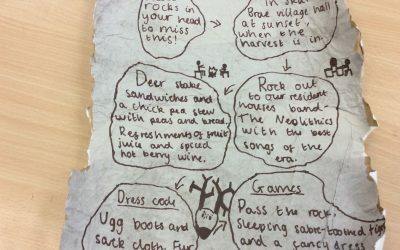 The children started to create World War 2 themed boxes using a range of very creative ideas. 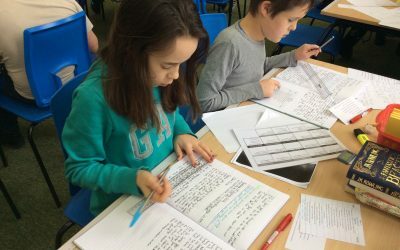 This week, Class 8 have been very busy writing their own World War 2 related flashback stories. 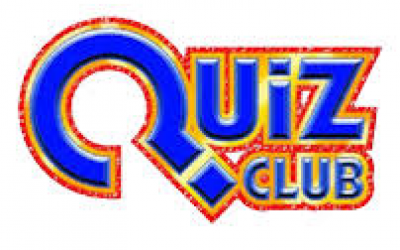 Cue a range of exciting events filled with fluctuating feelings and emotions, vivid imagery and several twists and turns. 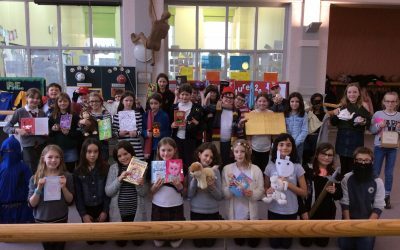 They have all been a delight to read! 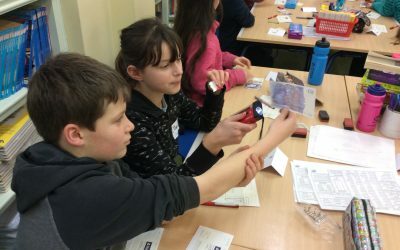 On Wednesday afternoon, Year 6’s from Class 8 and 9 took part in an exciting session run by representatives from either NatWest or John Lewis as part of their Children’s university project. 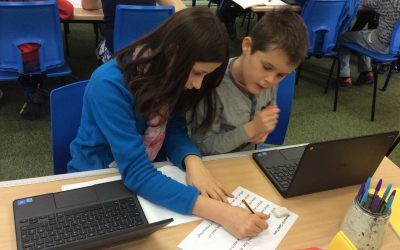 This week, we shared homework projects in groups and everyone found out a huge amount about some of the people who lived through the Second World War. 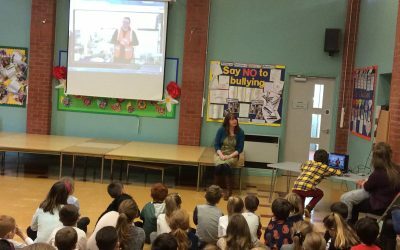 Thank you so much to everyone who shared memories, stories and artefacts belonging to family members. 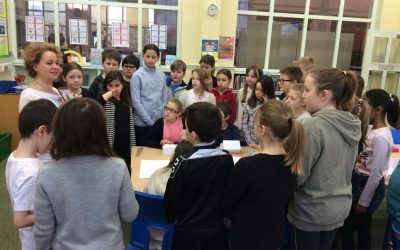 On Wednesday afternoon, Class 8 learnt about the life and achievements of Sir Isaac Newton with a particular focus on his discovery of gravity. 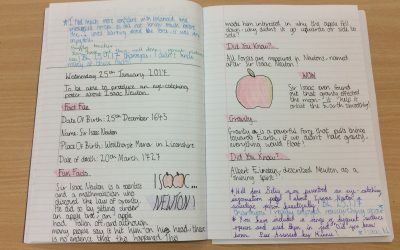 Each child produced an eye-catching poster to display their learning about this very famous scientist. This week we acted out the Battle of Britain in our P.E. session. 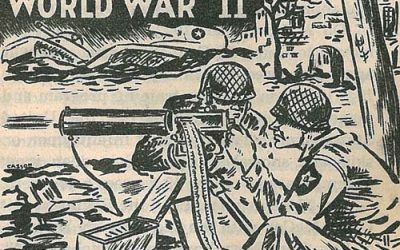 After many twists and turns, I was delighted to announce that the Royal Air Force defended the United Kingdom successfully against the German Air Force (Luftwaffe) attacks. 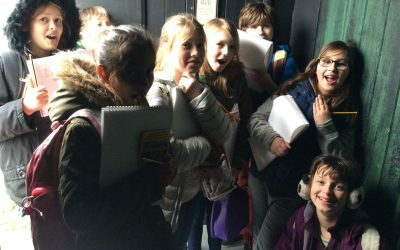 This week, Class 8 have found out a lot more about evacuation, specifically thinking about what life was like for evacuees in World War 2. On Thursday morning, we read the first few chapters of the story “Carrie’s War” by Nina Bowden. 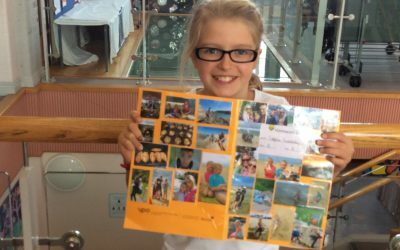 Each child wrote from the perspective of Carrie to describe the series of events that led to the worst day in her life. 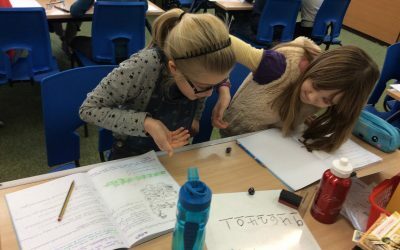 On Monday, we applied our knowledge of reading and writing numbers upto seven digits to an exciting dice game, where we added to and subtracted from a range of totals. 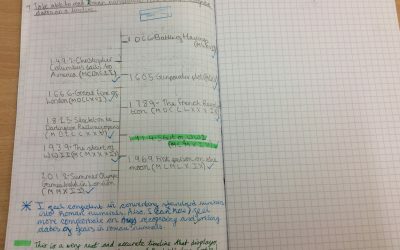 On Wednesday afternoon, we started to look at key events from World War 2 and ordered them on a timeline in our books. We will be looking at some of these events in greater detail in the upcoming weeks! 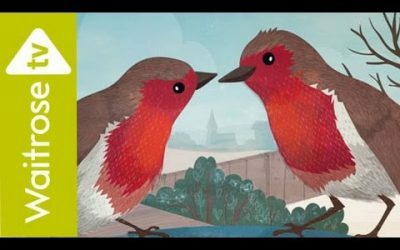 You’ve all worked incredibly hard this term so please have a lovely holiday with your families and friends! As it is a holiday, there will be no homework set. 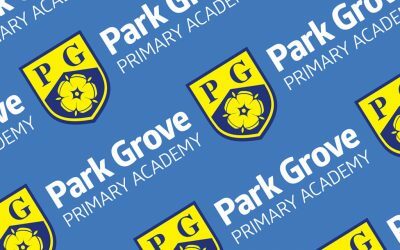 Please remember that you come back to school on Wednesday 4th January. With Best Wishes from Mr Mastrelli and Mr Symonds. On Thursday morning, we looked at each other’s homework projects. 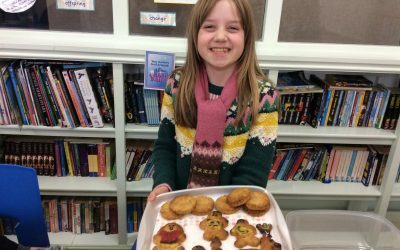 I was so impressed with the imagination, creativity and humour of your winter party ideas! 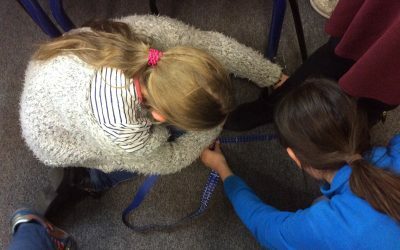 On Wednesday afternoon, Class 8 undertook a scientific investigation in groups about shoe sizes. 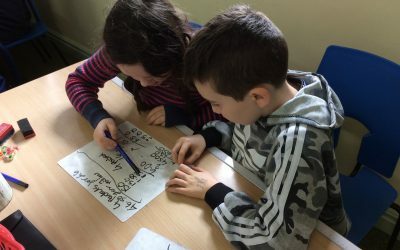 Each group chose a specific question, planned, measured and wrote up their investigation with some very interesting findings! 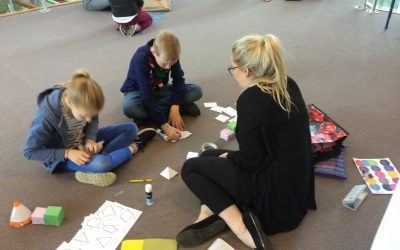 On Thursday morning, we were very fortunate to have students from York St Johns University come in to teach us a range of shape based tasks. 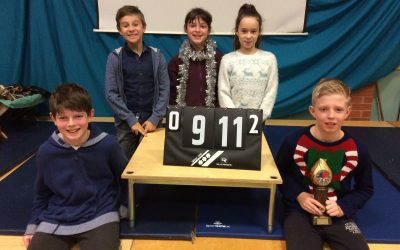 The Table Tennis Ladder League semi-finals took place on Wednesday. 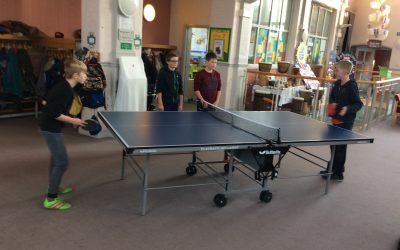 After two fabulous matches, Class 8’s Reuben will play Kian in the final, which will be played on Tuesday 6th December in front of the whole of Key Stage 2. 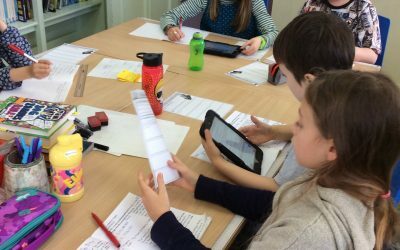 This week in English we have been researching about different Stone Age artefacts. 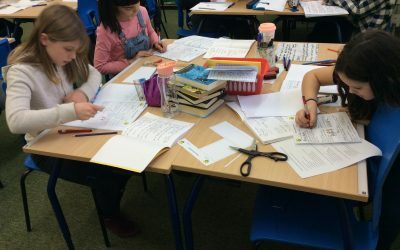 Each child wrote a formal information card about an artefact, writing as an expert! 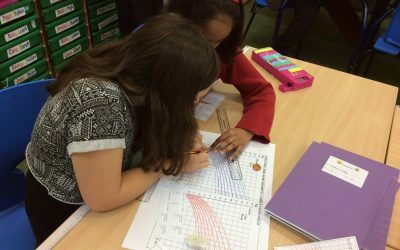 In science this week, Class 8 have been comparing existing and new growth charts to understand and describe changes of a baby’s weight. Now That’s What I Call A Super Skype! 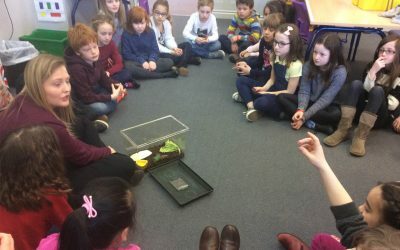 On Wednesday morning, we learnt about The Secrets of Stonehenge . 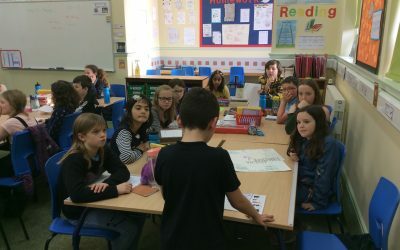 In pairs, the children retrieved and presented information about different sections to other children in the class. 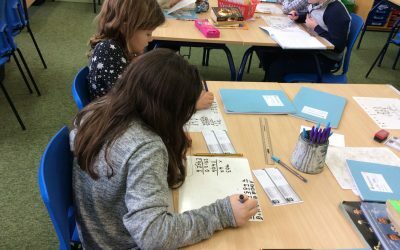 On Monday morning, Class 8 learnt about how to make logical links between numbers to calculate percentage amounts with greater ease. 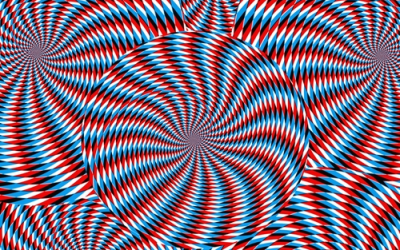 They produced magnificent fact webs showing these links clearly and on the whole successfully! 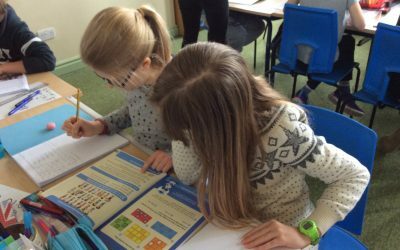 We have started our new topic this term on Ancient Britain by finding out about significant events from the Stone, Bronze and Iron Ages. 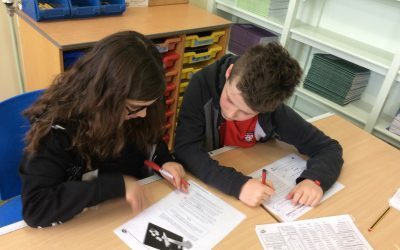 These important facts were represented clearly on accurate timelines by everyone in Class 8! 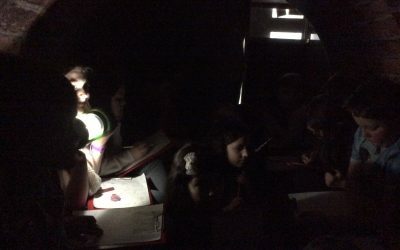 This week in English, we studied a dramatic story called “The Secret Cave”. 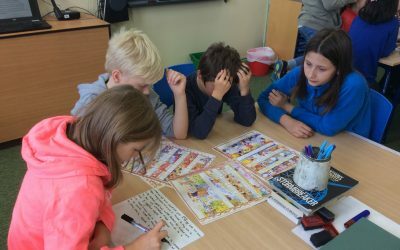 The children acted out key scenes as characters in small groups, thinking carefully about the varying feelings and motives of each character during their main adventure. 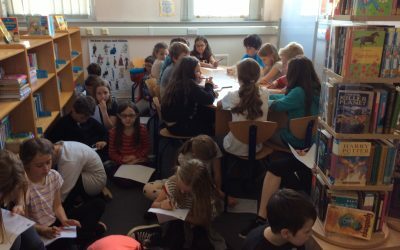 After days of preparation, Monday was the day when each group finally completed writing their own playscript based on a story from another culture. 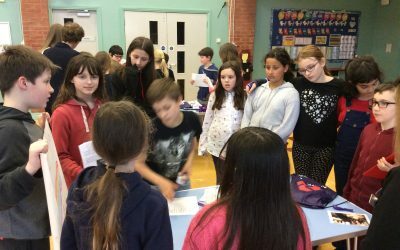 Every child worked really hard and the quality and humour in each collaborative playscript was clear to see! In our topic lesson on Wednesday afternoon, we explored the code of conduct practised by Buddhists. 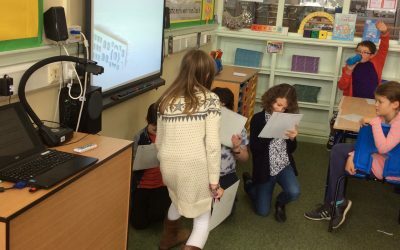 We looked at the Eightfold Path and used drama techniques to further our understanding of each rule. 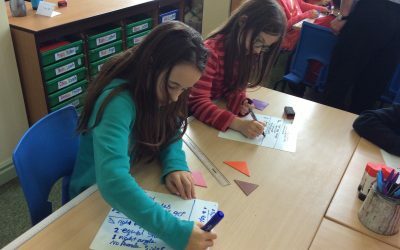 On Wednesday morning, we recalled our prior knowledge of shapes, using what we know about shapes to identify their properties and classify them. We then looked at properties of circles and calculated the diameter and radius accurately. This week in English, we have continued exploring stories from the Arabian Nights and read the Voyages of Sinbad. 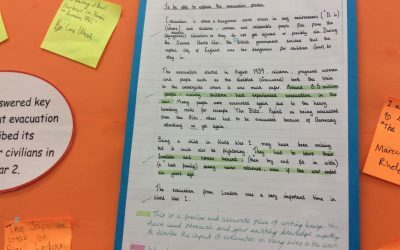 Each group summarised one of his voyages and then applied their understanding of the story to create a collaborative playscript. 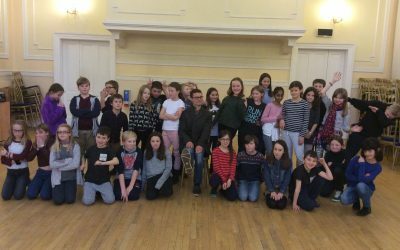 On Tuesday afternoon,the day our four class candidates had been waiting for finally arrived:the all important vote. 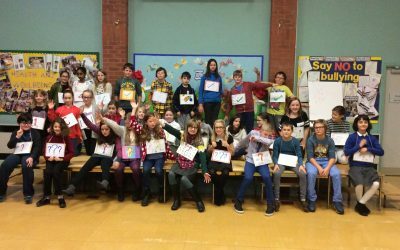 All the children in Class 8 voted, with the winning male and female candidates being announced in Good Work Assembly on Friday morning! 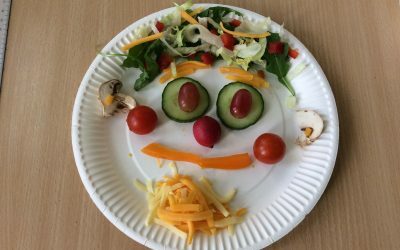 On Tuesday morning, everyone in Class 8 made a salad face using a range of healthy ingredients. 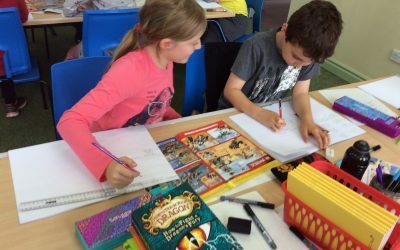 There were many fantastic creative and imaginative designs. I was delighted to see so many children eat the contents on their salad face too! 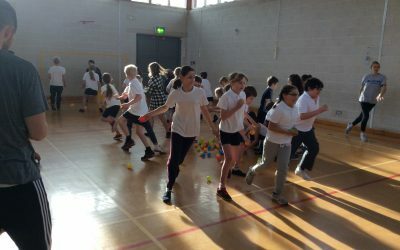 As part of health and wellbeing week, Class 8 have taken part in a range of exciting fitness activities. 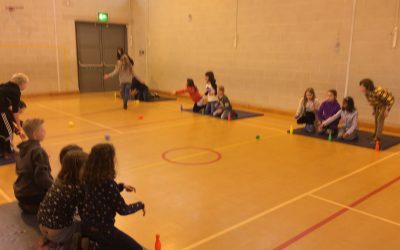 On Monday morning, we had a visit from AXIOM sports who delivered fun and action-packed games which all the children greatly enjoyed! 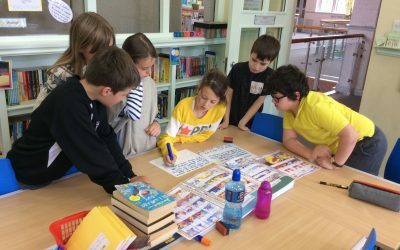 On Monday afternoon, Class 8 learnt about the names of several capital cities from across a range of countries and continents. 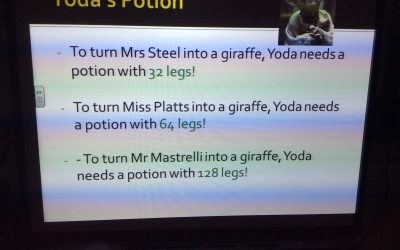 Class 8- What new information did you learn from this session?